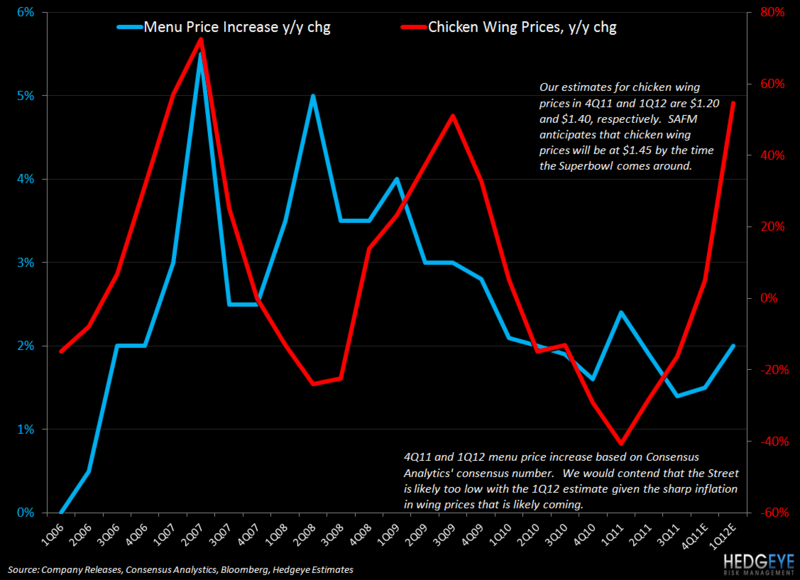 Buffalo Wild Wings has enjoyed a tremendous tailwind thanks to the sharp decline in chicken wing prices that continued through 2010 and much of 2011. Buffalo Wild Wings put up surprisingly strong 3Q11 results on the back of stronger-than-expected comparable restaurant sales of +5.7%, which implies a two-year average trend of +4.2% (versus +2.9% in 2Q). While this was an impressive number, the comp was largely fueled by the unlimited wings promotion that ran through the summer months. The year-over-year menu price increase, at +1.4%, was the lowest it had been since 2006. 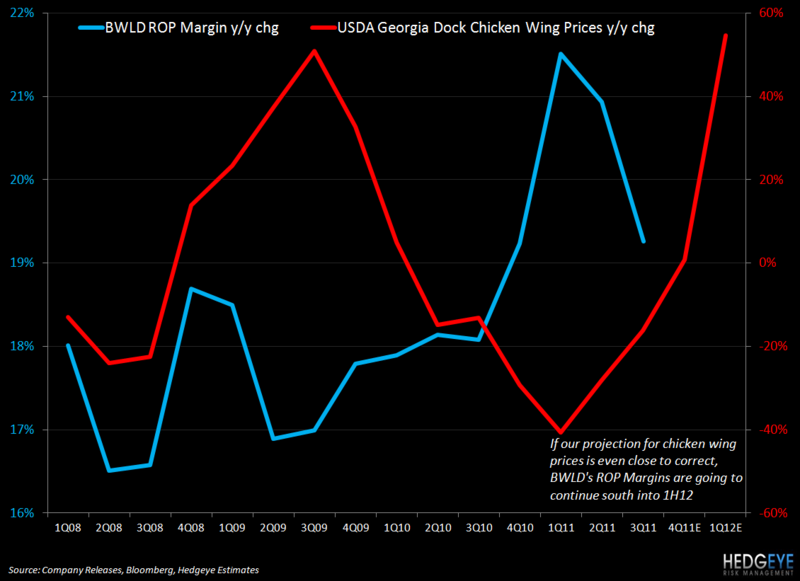 Thanks to -18% deflation in chicken wing prices during the third quarter, this impact of this strategy on the company’s restaurant operating margin was immaterial. The chart below shows the year-over-year menu price increase trend over the last five years. We would argue that the uptick in menu price that the Street is modeling (the 4Q11 and 1Q12 points below are consensus per Consensus Analytics) are likely too low. Please note that the price increase estimates for 4Q11 and 1Q12 (blue line) in the chart below are based on Consensus Analytics' consensus. We believe that wing prices in 4Q and 1Q will force this line higher than the Street is forecasting. The year-over-year trend in Chicken Wing Prices over the next couple of quarters is based upon an assumption that the upward trend will continue to $1.20 for 4Q and $1.40 for 1Q. At the SAFM Investor Day, Joe Sanderson stated that he was expecting $1.45 per lbs chicken wings by the time the Superbowl comes around. As processors cut production and the year-over-year demand profile points to higher prices, we believe a significant increase along the lines of what Mr. Sanderson anticipates seems reasonable. The reason why this is important for Buffalo Wild Wings is that it will no longer be feasible, from a margin perspective, for sales to be driven by a promotion similar to “Unlimited Wings”. In the event of there being upside risk to the Street’s menu price increase estimates for 4Q11 and, more likely, 1Q12, we would argue that comparable restaurant sales could disappoint. Some may point out that one risk to our thesis is that many food service operators successfully took advantage of comparatively low chicken tenderloin prices and promoted boneless chicken wings to alter the mix. Buffalo Wild Wings has been fairly consistent in the proportion of its revenue coming from the sale of boneless chicken wings over the past few years, despite significant moves in the price of traditional chicken wings. As a percentage of sales, boneless wings have been running at roughly 19% of sales during 2011 and 2010. 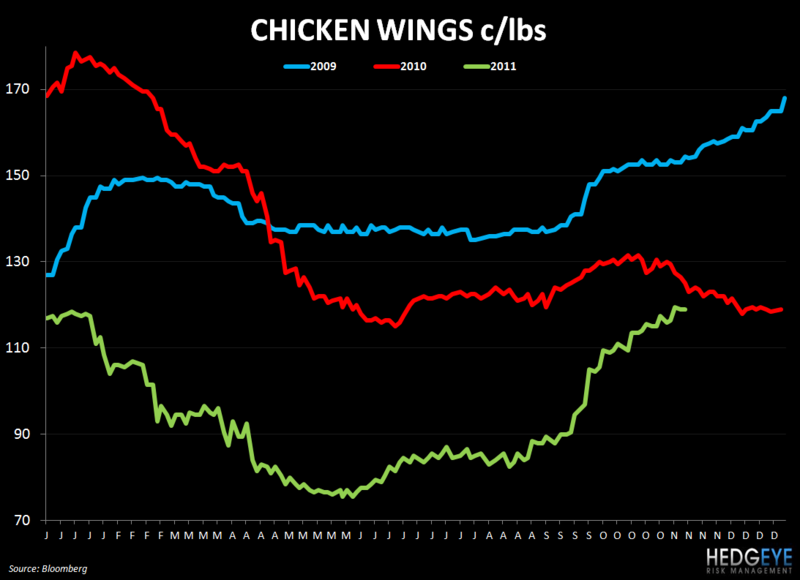 In 2009, when chicken wing inflation peaked, that figure was 19% (versus traditional wings at ~20%). 2009’s figure was a jump from the 16% of sales that boneless wings represented in 2008 and this helped offset the commodity headwind to a degree. Given that wing deflation did not lead to customers shifting back to traditional wings, it seems that this proportion of 20% of sales traditional and 20% of sales boneless may be difficult to shift without significant price manipulation. One question worth thinking about at this point is whether or not, in the event of significant inflation hitting the company’s P&L in 4Q11 and in particular 1Q12, the company can adequately shift customer preference away from traditional wings (spot market pricing) to boneless wings (which are contracted for the entirety of 2012 and some of 2013). We would doubt it. Even in the unlikely event that management can emulate the shift that we saw from '08 to '09 , we would argue that menu prices still need to rise more than consensus is projecting for 1Q12 earnings to meet expectations and this will be detrimental to traffic trends, which the business has –over the last few quarters – become increasingly dependent upon for comp growth. Looking at the Street’s view of Buffalo Wild Wings, it would seem that our concerns may not be shared by other analysts. Negative sentiment around the name evaporated more or less in step with chicken wing price inflation and we believe there is a high likelihood that it will reappear as wing prices start to impact the P&L. From a valuation perspective, BWLD is richly valued. Currently trading at 7.8x EV/EBITDA NTM versus a casual dining average of 6.8x (6.4x ex-BJRI), we believe that a negative catalyst could cause multiple contraction. For reference, one turn in the multiple represents $7.66 of upside/downside in the stock. 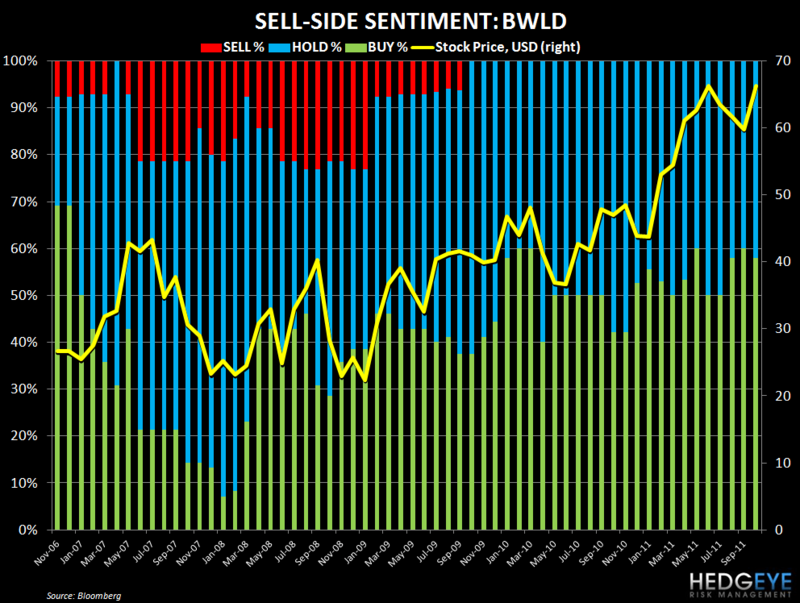 All in all, we believe that the next couple of quarters could prove difficult for BWLD given that the strategy it has used to drive sales as its commodity tailwind has subsided will not be viable when the tailwind is a strong headwind.